The Legend Of Legand's Amitabh Bachchan Joins Facebook Gets 872,533 Likes And 126,797 Talking About This ! Within just an hour of the activation, the page received 784,417 likes ! "Yipee! I am on FaceBook! My ID: FaceBook.com/AmitabhBachchan," the 69-year-old tweeted. "And!! It was close to 8 lakhs in half an hour!! Keep it coming, Baby," Amitabh tweeted. 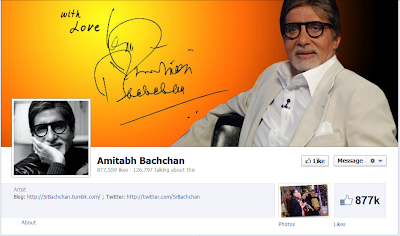 Amitabh's fan-page became visible Tuesday morning when the megastar also published a video taken from his home Jalsa. "Year after year, month after month, day after day we are coming closer to each other. Lovely to have you here and we shall be seeing each other and you will get to know more about me and my daily activities where I go, what I do though this wonderful medium. Thanks for being with me on Facebook and we will be with you very shortly. Thank you," says the video. As I Am A Big Fan Of Mr.Amitabh Bachchan Myself I just Wanna Say That Now This Is Reason Why Everyone Is Worth Having An Account On Facebook ! Congrats Amitabh Bachchan Sir Or Rather Should I Say Congrats Facebook ! Amitabh Bachchan Sir Is Not 69 Years Old Rather He is Still Sweet 16 With 53 Years Of Experience !